Look at that thing. Just look at it. For many years now I have been attempting to record, arrange and produce my own songs, and throughout that time I have come to roadblock after roadblock. I first started recording tracks when I was 18. I had a headset microphone that I used to record everything: vocals, guitar, bass… My microphone technique extended to ‘not overloading the mic’, and I suppose that was all I needed to know at the time. I also liked to pilfer drum samples from various sources on the internet, some with terribly low bit rates, but I could barely tell the difference between a 128kbps MP3 and a .wav file. Such young ears! Not long before the start of my ‘YouTube era’ I made use of a cheap dynamic microphone (bought cautiously with student loan!) that I had to plug directly into my PC using a 1/4 inch jack to mini jack adapter. It made for an unpredictable sound. It wasn’t a very stable connection so if I shuffled too much it’d come out in the recording as big old spikes of static. I’m not even sure if it improved a great deal on the range of frequencies I had with the headset mic, but it was progress. It took me some time to work out that my ears weren’t very discerning. I thought EQ-ing was just a case of boosting the last two ‘faders’ on my audio editing software and leaving it at that. Granted, that was probably a reasonably good option considering my lack of high frequencies… But I didn’t really understand the art of it. And then once I did, I found my tools to be frustratingly limited. Some evenings I would listen so hard to a mix, trying to work out how to reach my sonic ideal, but feeling as though I had become deaf to music and hearing only noise. With that ‘deafness’ I felt the desire to grant myself the title ‘producer’ was far too lofty an ambition. I figured I just didn’t have ‘it’, whatever ‘it’ was. The Golden Ear, the genius of sonic craft. I would listen to mixes created by my ever so talented musician friends and felt like banging my head against my laptop keyboard. What was I doing wrong? I read up on production techniques online, and although I was then equipped to shave off tiny parts of the rock I was trying to sculpt, it really did feel like I was doing so with a butter knife rather than a hammer and chisel. And then, equally as suddenly as my journey to that point had been gradual, my circumstances changed. My husband, lovely and supportive as he is, bought me a mixing desk for Christmas 2010 (not to mention a sustain pedal for my keyboard!). It meant I didn’t have to plug my mic into my poor laptop any more… and the sound was so much clearer than it had been, but I still felt frustrated. I still needed one more thing: a new microphone. A good microphone. One designed to pick up the subtleties of the voice and the tiniest pattering of the fingers on the body of an acoustic guitar. I wanted my mixes to sound the way my ears hear. I wanted to capture the music of the natural and the ordinary in all its shimmering detail and guttural rumblings. There was just so much beauty in sound, but I had no means to chase it down and tame it. But today? Today I have claimed my prize. Three prizes, to be precise. Household budget now factors in my terribly expensive career choice (hobby..? obsession..?). I got a new XLR lead (F to M this time, as opposed to ending in a jack), a shock mount, and to go with it the most beautiful piece of equipment I’ve probably ever owned: a condenser mic. 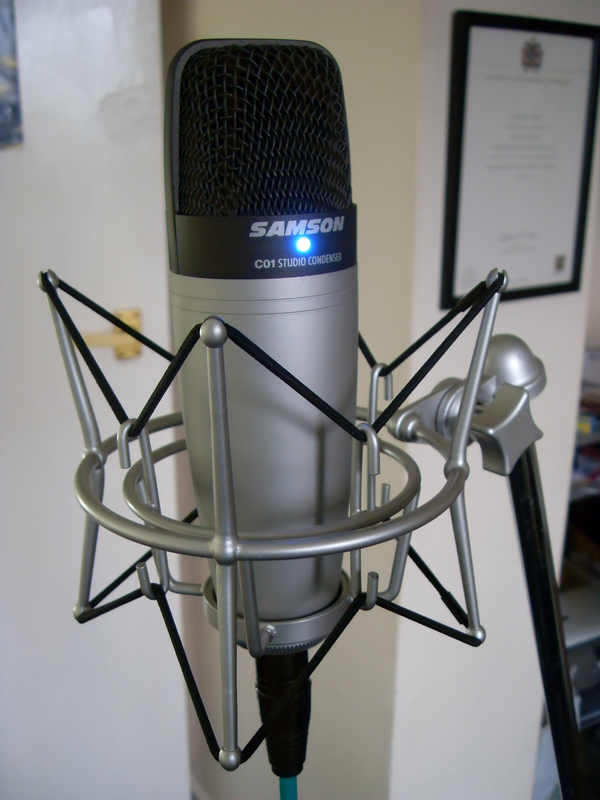 One manufactured for the main purpose of recording vocals, acoustic instruments, and the overhead sounds of a drum kit (not that I think I’ll be using it for the last one…). I tried it out this afternoon, just messing about with some guitar bits and humming a little, and it seemed to intuitively know which sounds I wanted it to pick up and which ones I’d rather it sweep under the recording rug. I still needed to fiddle with the EQ afterwards since I haven’t worked out the best positioning, but the response I got out of the recording when I did was incredible. I’ve decided it must be alive, and it likes me. It is my pet mic-ie and I love it. I shall name it.